We do a substantial amount of work for local government entities. That work consists of jobs as simple as sidewalk replacement. Sidewalks need to be kept to the highest standards as they are used by the public and need to be safe. Over time, trees can make sidewalks uneven and even dangerous to walk on. They need replacement. A second area is road work. After a utility has to dig up a road way, they back fill the area and pave over the top of it. It is common to see the area that was excavated settle. Now there is a low area in the road. With our trucks, we can back fill the excavated are with Flowfill. See more about flowfill here. The essence of flowfill is that it is low strength concrete. Strong like concrete and wont settle. However because it is low strength, it can be excavated much like compacted dirt. When you pave over flowfill, it wont settle. Flow fill is also used by bridges, so that when the bridge ends and road goes over dirt, there isn't a settlement of the ground and the roadway. If flowfill is used, the bridge deck and the adjoining roadway stay at the same level with no drop off. 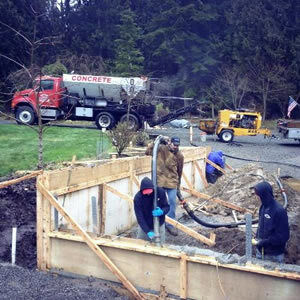 Best Way Concrete of Seattle is ideal for the delivery of just the right amount of concrete for a small slab. Other examples of small slabs could be used for Hot Tub pads, Patios, Utility Box pads, etc. 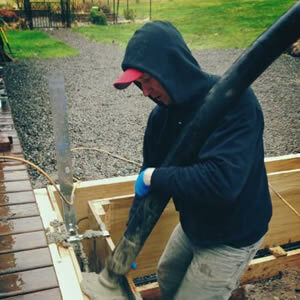 Narrow concrete forms for walls and footings can be a very difficult pour without a line concrete pump. Minimize the price of concrete placement to weighing the option of pumping versus using wheel barrows to place the concrete. Closeup of concrete pumping into the forms. Best Way Concrete Delivery is an ideal process way to pour small volumes of concrete in hard to reach places, such as the retaining wall right off the lake.